When it was announced yesterday that Thor will now be a woman I was a bit surprised and interested at the choice. Of course, it isn't the first time in comics we have seen gender bending, and Thor in particular is a good character to do this with because Thor is not human to begin with and could take any form. Like most big comic announcements, there is a lot of hype but you wonder how long the big new shake up will apply for. Usually you see a character die only to reappear a year later or less. What it really comes down to is a marketing gimmick using an already popular character to appeal to the growing numbers of female comic fans. This to me is a good sign in a way, in that the industry has finally acknowledged that they even have female consumers, but this won't solve the diversity and misogyny problem in comics. It is like when Marvel made a black incarnation of Spiderman, Miles Morales. Only, we don't see them using Miles as Spiderman in the recent movie franchise, or for the merchandise of the title in spite of Peter Parker having been used in the first Spiderman movies only 10 years ago. Similarly, when a (terrible) Green Lantern movie was made they chose to use the white incarnation of the Green Lantern character, Hal Jordan, instead of the John Stewart character who was used in various animated shows. In the end, Thor will still be a male character, and will be marketed as such in the movie franchises, Thor and Avengers. At the same time, we have yet to see a female superhero get her own movie in the Marvel universe. Black Widow is one of the most prominent female characters in the franchise but has yet to get her own movie. Wonder Woman will be relegated to a cameo in the new Batman VS Superman Movie and the subsequent Justice league movies. One exception has been the decision to cast Michael B Jordan as the Human Torch in the upcoming reboot of the Fantastic Four movie franchise, which was met unsurprisingly with considerable push back.So I find it difficult to give marvel or DC a pat on the back for any attempts at diversity when they haven't really hit at the heart of the matter. The people making decisions about the movies and the comic books are mostly white men. When you have a diversity problem in the creative side, it shouldn't come as a shock when there is a diversity problem in the end product. Getting new ideas from different kinds of people and promoting and encouraging more diverse characters will bring a whole new aspect to the comics and in the end, the movies. It seems that efforts being made by the comics industry are being subverted in the translation to the movie franchises, which in the end are the biggest money makers with the largest audience, and the characters will be most remembered in their movie forms. In order to really tackle the diversity issues in comics and comic book movies, they need to make new characters or use existing ones more instead of trying to make a popular white male character into someone else for a short time only to go back to the white male incarnation whenever they need to market the brand or push a movie franchise. Can we get a Bat Girl movie? A Storm movie? A Black Panther movie? Why not? Considering the huge influx of superhero movies of late, I hardly see why the focus has to be always on the white and male characters. 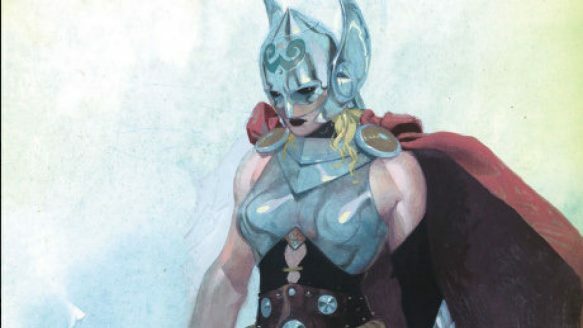 A female Thor is great, but let's not pretend that it will solve the diversity problem in comics.